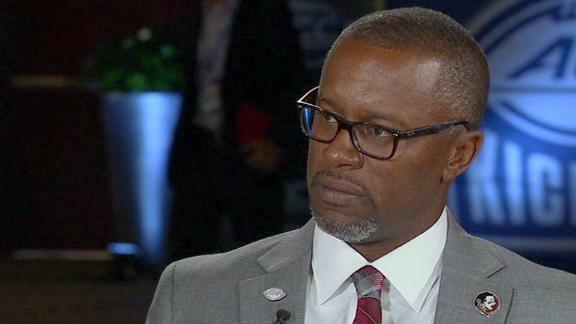 Willie Taggart joins College Football Live and says he's looking for a leader at QB in the battle between Deondre Francois and James Blackman. Andrea Adelson explains how Florida State QB Deondre Francois had been spending the offseason trying to be a better leader and example for his team. Texas A&M head coach Jimbo Fisher responds to FSU QB Deondre Francois' tweets about him leaving Florida without communicating the move to him. Paul Finebaum says that after the loss of Deondre Francois, it will be difficult for Florida State to run the table with Miami and Clemson on the schedule. Florida State quarterback Deondre Francois is out for the season after suffering a patella tendon injury in his left knee during the Seminoles' season-opening loss to Alabama. The reigning ACC Rookie of the Year looks to build on his promising freshman campaign. Lamar Jackson, Sam Darnold and Jalen Hurts headline the top QB Heisman hopefuls. Florida State quarterback Deondre Francois joins SVP to discuss avoiding taking as many hits as he did last season and his mindset opening the season against Alabama. While showing off his trapeze skills, Marty Smith breaks down the quarterback matchup of Deshaun Watson and Deondre Francois that will be facing off Week 9 in college football. Deondre Fancois hits Dalvin Cook on a wheel route for a 24-yard gain for Florida State.